It is a picture of touching domesticity: children in the early 1940s racing around a Polish villa’s spacious garden on their bikes, leaping in and out of the swimming pool, picnicking under the sun. One child, ­Heideraud, plays with her pet tortoises, while Klaus grooms his two dalmatians. There is a beehive, where daddy Rudolf shows his offspring how to extract honey, and raspberries ripening on trellises. This privileged family had two maids, a chauffeur, a governess, a tailor and barber and a seamstress. Not bad for a provincial boy from Baden-Baden, who had won his way to such a lifestyle by ambition, loyalty and dogged hard work. No wonder Hedwig, Rudolf’s wife, enthused that she wanted their idyll to continue for ever. What was less idyllic was the high wall that screened this cosy home from the labours of its paterfamilias. 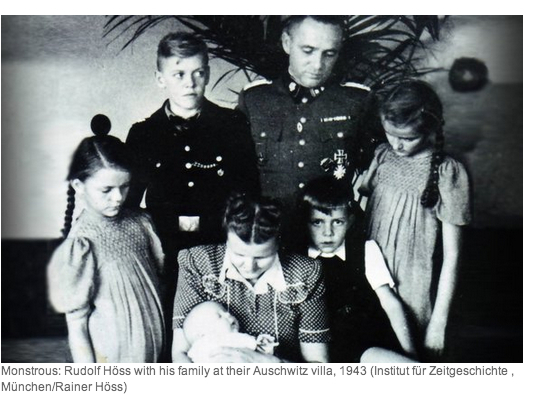 Because he was Rudolf Höss, commandant of Auschwitz and architect of its gas chambers; probably the greatest mass murderer in ­history, unless one of Stalin’s ­creatures pitches for that title. In 1945, when happy times ended abruptly for the Nazi leadership, Höss secured false papers and disappeared into the German countryside. He hoped, like many others, including the camp’s doctor, Josef Mengele, to secure a passage to a new life in South America. He might have succeeded, too, but for a young man in British uniform, named Hanns Alexander. Thomas Harding is a journalist who has uncovered a ­remarkable story, then linked it to another. The story of Höss, a monster who devoted himself to killing Jews with the single-minded dedication ­others bring to running a factory or a government department, is relatively familiar. But nobody has hitherto heard of Alexander, the author’s great-uncle. Harding’s curiosity about him was roused by stories he picked up at Alexander’s funeral in 2006. The odyssey he has since traced is extraordinary, even by the standards of that remarkable and hideously blighted Jewish generation. Hanns and his twin brother were born in Berlin in 1917, to a highly successful doctor. He enjoyed a privileged childhood until, in 1936, almost the entire family decamped to London, where they had relatives. As Jews it was a good call, even though their reception in Britain was lukewarm. Hanns and his brother found office jobs, and set about learning English. At the outbreak of war, they volunteered immediately for the RAF, only to be rejected as enemy aliens. Instead, like most of their kind, they were enlisted in the Pioneer Corps, and later commissioned. At the end of the war, after the revelations about the concentration camps, Hanns was determined to play a part in exacting retribution for the ghastly fate of his people, including his aunt. He became a junior officer in a ­war-crimes investigation group led by the actor Leo Genn, then a lieutenant colonel. The allied teams charged with tracking down Hitler’s killers were tiny. This reflected chiefly, in my view, a moral exhaustion that overcame most of the belligerents in 1945. There was little appetite for retribution on the scale the Nazis’ crimes justified, matched by an awareness that Stalin’s tyranny (which had made victory possible) was as evil and murderous a force as Hitler’s, even if its malevolence had been exercised chiefly against the Russian people. Hanns, aged 28, felt differently. At Belsen, where he was initially based, he became involved in the interrogation and trial of guards and low-ranking officers. He was embittered by know­ledge that the big fish had vanished into the maelstrom of fugitives crowding Germany and central Europe. Having secured reluctant licence from Genn to go hunting, Hanns set forth with a jeep and a list of prominent wanted men. His first notable success was to track and arrest Gustav Simon, the former Nazi overlord of Luxembourg, who obligingly hanged himself in custody. Then the young man began searching for Höss, who was responsible for the deaths of more than 2m Jews. In the author’s words, Hanns was “determined to the point of brutality”. His modus operandi was to head for a suspect’s last known locality equipped with a pistol, handcuffs and a travel permit. On arrival, he visited a police ­station or town hall, checked addresses, then used them to quiz relatives, neighbours, landladies. The information he gleaned, often from reluctant or mendacious witnesses, led him from town to town across Germany. Many men of the occupying armies, celebrating their own survival, and revelling in girls and loot and the easy life, must have wondered why Captain Alexander bothered. But he was driven by a passion. Hot on Höss’s trail, he soon located and interrogated the Auschwitz commandant’s wife and children, who initially denied all knowledge of him. Camp inmates, 1945By now, though, it was March 1946. The hunter was in a hurry, and modern niceties of police procedure did not exist. The next day Hanns burst into the cell where Hedwig was being held at ­Lunden prison. A train was gathering steam outside the walls. Hanns told her it would take her eldest son forthwith to Siberia unless she told him where her husband was. He left her for a few minutes with paper and pencil, and returned to find she had written the name “Franz Lang” and details of a farm near Gottrupel. The following day, accompanied by a doctor and 20 soldiers, Hanns raided the farm and seized the Auschwitz commandant. Then he told his men: “In 10 minutes I want to have Höss in my car — undamaged.” They took their cue and beat him with axe handles until the doctor called them off, “unless you want to take back a corpse”. A psychiatrist later classified Höss as “an amoral psychopath”. After his conviction and inevitable sentence, he wrote, “My dear and good children, your daddy has to leave you now”, and was hanged in Poland on April 16, 1947. Hanns went back to England and married Ann, a fellow Jewish refugee who had waited for him through the war years. He worked in modest roles at City banks, latterly Warburg, for the rest of his career, and became a pillar of London’s Liberal Jewish synagogue. In 1986, at the age of 69, he and his wife threw a “Thank you Britain” party at the site of Croydon aerodrome, where he had first landed on British soil half a century earlier. Of the twin stories Harding tells so well, that of his great-uncle is by far the more fascinating and moving. The experiences of the German Jews who came here in the 1930s, and the extraordinary gifts with which they infused a pretty unappreciative British society, never cease to amaze. This is a remarkable book, which deserves a wide readership even among those who think they are bored with the Holocaust.